Nintendo had its share of hits and misses over the years. Trivia buffs might enjoy knowing that Nintendo began as a company that made a popular card game, Hanafuda cards. Game Boy, Super Mario, the Nintendo DS, and the latest Nintendo Switch are some of the more popular successes. Others, like the Wii U, not so much. Recently, in a departure from its twitch-play roots, Nintendo announced LABO. Perfect timing. 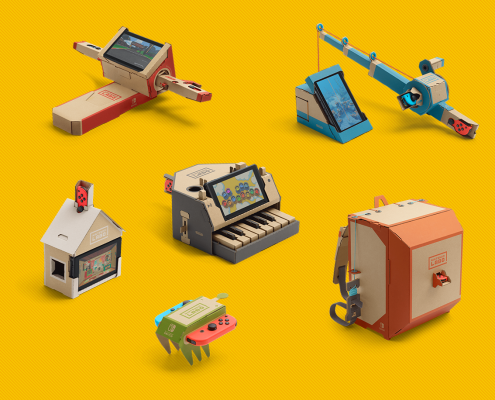 Labo speaks to parents who want their kids to be “making,” not just “twitching.” Everything you need to be a creator comes neatly packaged, with a starting price of $69. Cardboard pop out pieces assemble into place, and they’re brought to life with the Nintendo Switch software. You can drill down to learn how the Switch controls the toys. STEM meets twitch. Remember the movie Ruthless People? Bette Midler gets kidnapped by some thugs who want to extort money from her ex-husband. While in captivity, Midler takes up exercising to pass the time. She sheds a ton of weight and turns drop dead gorgeous. I was reminded of that this week when I was holed up in my “I forgot how rough and tumble it is” hotel in San Francisco’s Tenderloin District. Rather than tempt the fates on a late night stroll, I used the hotel’s Peloton bike, somewhat manically. For those who aren’t familiar with the cult …. Peloton is a super-connected spin bike. The best instructors in the world gather up minions from all corners of the globe, connected via the web, to take a worldwide spin class. You pick your music, your type of workout and follow a big LCD screen where you can watch the instructor and get pumped about seeing how others are doing on your live feed. Peloton experiences don’t come cheap. You’ll pay $2k for the bike and the subscription is $39 monthly fee. But, it was so exhilarating that I’m rethinking my gym membership. Read more about how streaming video is capturing new audiences. To find out more about the CES 2019 Fitness Tech Marketplace where Peloton has been a past star, click here. Move fast and break things? Hmm.. not so sure that as you age, that high tech adage doesn’t bend more towards move slow and don’t break anything. I’ve been talking to young and old alike about what it means to be serially entrepreneurial, as you age. The results of that journey have been recorded by MSNBC’s Your Business. Take a look at my journey at this year’s Collision conference, as old and new people and ideas collide. The show airs Sunday 6/10/18 at 7:30am EST and will be rebroadcast on Saturday 6/16/18. StartUp Taiwan, The Room and The McKinsey Trivia Challenge all appear. Got other trends you want to talk about?